Bolstered by record appropriations from the Texas Legislature, TPWD, river authorities and other partners are stepping up the war against an army of non-native plants and animals that threaten our waterways. Learn more about these efforts. Fish, shellfish, and aquatic plants that are not native to Texas may compete with native animals and plants for food and space. Because introduced species lack natural enemies in their new environment, they can multiply and spread at an alarming rate, interfering with boat traffic, affecting water quality, and causing a range of other problems. In order to manage and conserve our natural resources, Texas Parks and Wildlife Department enforces laws to protect our state waters against the introduction of exotic species. Some exotics, such as triploid grass carp and water spinach, may be handled and distributed by people who have the appropriate permits from Texas Parks and Wildlife Department. Others are so dangerous that we need to do everything we can to stop them from spreading. Get complete list of prohibited aquatic organisms. Exotics often travel from one water body to another by "hitching a ride" on a watercraft. To curb the spread of invasive species, boaters in Texas are required by law to remove harmful plants and animals from boats and trailers before leaving the vicinity of a lake, river, or bay. Learn how to properly clean your recreational equipment . Find out more about the many invasive species that pose a threat in Texas, where they're found, and how you can help. Visit TexasInvasives.org. Zebra Mussels have been found in lakes Austin, Belton, Bridgeport, Canyon, Eagle Mountain, Georgetown, Grapevine, Lady Bird, Lavon, Lewisville, Livingston, Ray Roberts, Richland Chambers, Stillhouse Hollow, Texoma, Travis, Waco, Worth, and three small lakes in Dallas and Grayson counties. 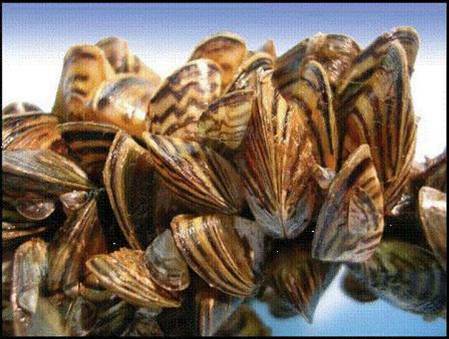 Zebra mussels or their larvae have ocasionally been detected in other lakes and rivers. See map. To combat the spread of this destructive pest, a statewide rule requires draining of water from boats and onboard receptacles when leaving or approaching public fresh waters. 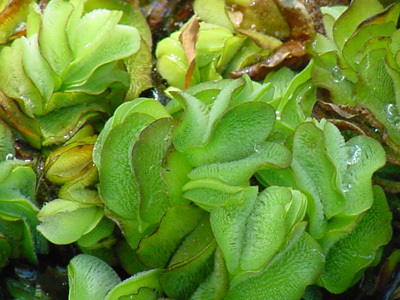 Giant Salvinia. Spotted in several East Texas lakes. An infestation can double its size in just one week. 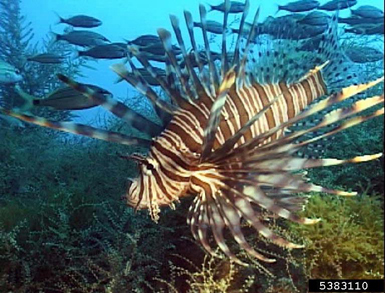 Lionfish appeared off South Florida in 1985 and spread rapidly, moving up the East Coast in the 2000s, covering the Caribbean by 2009 and then invading the Gulf of Mexico, reaching Texas in 2011. For more on this marine pest, see our Frequently Asked Questions.